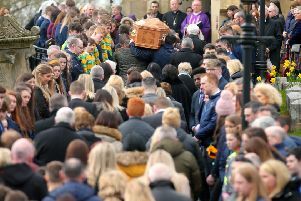 The two people charged with the murder of Owen Creaney last year appeared in the dock last Friday at Craigavon Magistrates Court. Both were produced from custody for the purpose of a preliminary enquiry and they appeared separately in the dock. Stephen Thomas Hughes (28), whose address was given as HPM Maghaberry, was first to appear. A legal representative for Banbridge woman Shauneen Boyle said they had just received the papers the previous Wednesday and they ran to 2,500 pages. He applied for an adjournment for four weeks to decide whether her case could run as a preliminary investigation. Mr Conor Downey, representing Hughes, said his client would have no objection to the matter being adjourned. Boyle (24), Edenderry Park, then took her place in the dock after Hughes had been taken down to the cells. District Judge, Mr Mervyn Bates, adjourning the case until June 19, said it was a reasonable request given the nature and seriousness of the case and the volume of papers. Hughes and Boyle are charged that between July 3 and July 6 last year they murdered Owen Creaney. Mr Creaney was aged 40 and came from Victoria Place, Lurgan. Police discovered his body hidden in a wheelie bin.